This article is about the stage production. For the pinball machine featuring music from it, see The Who's Tommy Pinball Wizard. 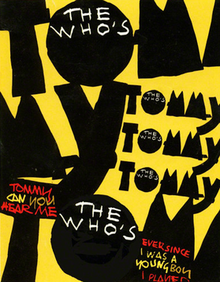 For The Who's original concept album, see Tommy (album). For the film, see Tommy (1975 film). The Who's Tommy is a rock musical with music and lyrics by Pete Townshend and book by Townshend and Des McAnuff, based on The Who's 1969 rock opera Tommy. The musical opened at La Jolla Playhouse in San Diego, California, on 1 July 1992. The Broadway theatre debut was at the St. James Theatre on 29 March 1993 with 27 previews running through 10 April. The show then officially "Opened" on 22 April 1993 and closed on 17 June 1995, after 899 performances. Produced by Sir George Martin and directed by Des McAnuff, with choreography by Wayne Cilento, the original cast included Michael Cerveris (Tommy), Marcia Mitzman (Mrs. Walker), Jonathan Dokuchitz (Captain Walker) and Cheryl Freeman (The Gypsy/Acid Queen), plus an ensemble that included Alice Ripley, Christian Hoff, Norm Lewis, Paul Kandel, Tracy Nicole Chapman, Michael Gardner and Sherie Rene Scott. The play subsequently was produced by various touring companies throughout North America and Europe. This musical inspired Data East's production of a pinball machine called The Who's Tommy Pinball Wizard, which used music, sound effects and artwork based on the original Broadway production. A Canadian Production opened at the Elgin Theatre in Toronto on 1 March 1995, and played throughout the year. The production featured an entirely Canadian cast, and the lead character of Tommy was played by Tyley Ross. Once the Toronto run ended, the production went on a Canadian tour. A production ran in the West End at the Shaftesbury Theatre from 5 March 1996 until 8 February 1997, featuring Paul Keating (Tommy) and Kim Wilde (Mrs. Walker). The original Broadway cast performed a one night only reunion benefit concert at the August Wilson Theatre in New York City on 15 December 2008. Produced by The Path Fund/Rockers on Broadway, the concert was a benefit for Broadway Cares/Equity Fights AIDS, the Broadway Dreams Foundation and the Bachmann-Strauss Dystonia and Parkinson Foundation. Des McAnuff revived the musical at the Stratford Festival of Canada from 4 May until 19 October 2013 at the Avon Theatre in Stratford, Ontario. Aria Entertainment and Greenwich Theatre revived the show in London at the Greenwich Theatre from 29 July until 23 August 2015. A new production by New Wolsey Theatre, Ipswich (in co-production with Ramps on the Moon) began touring from March 2017 in Ipswich before heading to Nottingham Playhouse, West Yorkshire Playhouse, Birmingham Repertory Theatre, Theatre Royal Stratford East and Sheffield Theatres. It is directed by Kerry Michael and features original West End cast member Peter Straker as the Acid Queen (after previously playing the Narrator). A production featuring Andy Mientus as Tommy opened on 27 April 2018 at the Denver Center for the Performing Arts. Note that there are several plot differences between the album, the film, and the stage production, though the general storyline is largely the same. An opening montage of London is presented, beginning in 1940 with the initial meeting and then marriage of the Walkers. Amidst World War II, the husband, Captain Walker, parachutes into Germany, where he is captured as a prisoner of war by the Nazis ("Overture"). Back in London at 22 Heathfield Gardens, the captain's brother Ernie delivers a care package to the pregnant Mrs Walker just as two officers arrive at the home to announce the disappearance and presumed death of her husband ("Captain Walker"). The following year, two nurses gently hand Mrs Walker her newborn son, Tommy; later, in 1945, American troops liberate Captain Walker's POW camp, proclaiming the end of the war ("It's a Boy" / "We've Won"). Mrs Walker has since attained a new lover, and they celebrate her twenty-first birthday and discuss marriage together with four-year-old Tommy ("Twenty-One"). To their surprise, Captain Walker enters the house and a fight erupts between Captain Walker and the boyfriend. Mrs Walker turns Tommy away, but he watches his father shoot the boyfriend to death through a large mirror. Captain and Mrs Walker embrace but soon realise what Tommy has witnessed, and violently shake him, telling him he didn't see or hear anything ("What About the Boy"). The police arrive; Tommy simply gazes at the mirror in silence. A narrator—Tommy's older self—appears to the audience, introducing and framing the story of his exceptional childhood ("Amazing Journey"). Captain Walker is tried for murder but found not guilty by reasons of self-defense. However, Tommy fails to celebrate his father's release, and his family quickly realizes that he has apparently gone deaf, dumb, and blind. Tommy's parents have him undergo a battery of medical tests, to no avail ("Sparks"). At ten years of age, Tommy's unresponsive state remains unchanged ("Amazing Journey – Reprise"). The Walkers all go to church and host a Christmas family dinner, though the family is unnerved that Tommy does not know that it is Christmas or understand its significance ("Christmas"). Everyone is stunned when Tommy responds only to his uncle Ernie's playing the French horn. Mr Walker, in a desperate attempt to reach his son, shouts "Tommy, can you hear me?" multiple times. Older Tommy, only visible to young Tommy, who persistently stares at the mirror, sings to him ("See Me, Feel Me"). The Walkers leave Tommy with a slew of vicious babysitters, including alcoholic and sexually abusive Uncle Ernie ("Do You Think It's Alright?" and "Fiddle About"), as well as his cousin Kevin, a sadistic bully ("Cousin Kevin"). Cousin Kevin and his friends take Tommy to a youth club where, to everyone's astonishment, Tommy plays pinball brilliantly ("Sensation"). Meanwhile, another doctor, a psychiatrist, tests Tommy yet again with no success ("Sparks – Reprise"). The desperate Captain Walker is approached by The Hawker and Harmonica Player ("Eyesight to the Blind") who promise a miraculous cure for Tommy. They take young Tommy to the Isle of Dogs to find a prostitute called The Gypsy, who tries to convince Captain Walker to let her spend time alone with Tommy, introducing him to drugs ("The Acid Queen"). Horrified by her methods, Captain Walker snatches Tommy away. By 1958, Tommy has apparently become a pinball-playing expert as Cousin Kevin and a group of adolescents await 17-year-old Tommy's appearance at the amusement arcade, where his rise to local popularity has begun ("Pinball Wizard"). By 1960, Tommy has become the local pinball champion and hero of the neighbourhood lads ("Underture"). Captain Walker persists unsuccessfully in seeking doctors and a cure for Tommy ("There's a Doctor" and "Go to the Mirror!"). One doctor discovers that Tommy's senses do function but not at a self-aware or openly expressive level. On the street, a group of local louts surround Tommy ("Tommy, Can You Hear Me?") and carry him home. The Walkers, at their wits' end, passionately confront each other ("I Believe My Own Eyes"). Tommy stares into the mirror blankly as his mother tries desperately to reach him one last time, before smashing the mirror in a rage ("Smash the Mirror"). With the mirror in pieces, Tommy suddenly becomes fully lucid and interactive for the first time since the age of four, and he leaves home ("I'm Free"). Through 1961 to 1963, news of Tommy's miraculous regaining of full consciousness receives huge media attention ("Miracle Cure"), Tommy is idolised by the public and the press ("Sensation – Reprise"), and he begins appearing in stadiums, playing pinball with a helmet that temporarily blinds and deafens him ("Pinball Wizard – Reprise"). Uncle Ernie tries to capitalise on Tommy's newfound stardom, by selling cheap souvenirs for a grand opening party of Tommy's new holiday camp, resulting from Tommy's cult-like following ("Tommy's Holiday Camp"). That night, an adolescent fan named Sally Simpson falls from the stage in her eagerness to touch Tommy and is pummelled by guards ("Sally Simpson"). Tommy, in horror, stops the show and tends to Sally. Realising how caught up in celebrity he has become, Tommy wishes to do something in return for his fans and invites them all back to his house ("Welcome"). Once there, the population of fans keeps growing, though Tommy generously, but naïvely, wishes to welcome everyone equally. Sally then asks Tommy how she can be more like him and less like herself ("Sally Simpson's Question"). He is confused, and insists that there is no reason for anyone to be like him, when everyone else already possesses the gifts that he was deprived of most of his life. He suddenly realises that he had thought his fame came from his miraculous recovery, when it in fact arose due to his fans desire for a spiritual leader, hoping he could communicate wisdom from his experience of not being able to hear, see, or talk for so long. Now, disenchanted with their hero for failing to provide the answers they wanted to be told, the crowd turns on him and leaves ("We're Not Gonna Take It"). Tommy hears the voice of his ten-year-old self ("See Me, Feel Me") and for a moment, to the horror of his family, seems to be reverting to his old state. But instead he turns to his family, whom he has ignored during his stardom, and embraces them in acceptance, before he climactically reunites with his younger selves onstage ("Listening to You"). The original 1969 album was much more ambiguous in its specific plot points than the stage musical and film versions. Originally, the song "Twenty-One" was called "1921" as the album version took place in a post-World War I setting. In the film, the story was changed to be post-World War II and the song was changed to "1951". In both the album and stage versions, the father comes home and kills the lover in the confrontation. Ken Russell's film made a reversal and killed Mr. Walker's character, having the lover then assume the role of a step-father to Tommy. Pete Townshend made a number of lyrical changes to songs for the film version, many of which were utilized in the stage musical (these include revisions made to "It's a Boy", "Amazing Journey", and "Tommy's Holiday Camp", among others). The new pieces created for the film, however ("Bernie's Holiday Camp", "Champagne", "Mother and Son"), were not retained for the stage production. Instead, Townshend wrote a new piece called "I Believe My Own Eyes" in which the Walkers resign themselves to accepting Tommy's fate after years of trying. Tommy's experience with the Acid Queen (Scene 11) is also handled differently between the Album, Movie, and Stage productions. In both the album and movie, Tommy appears to have taken a drug from the Acid Queen which produced a visceral response in the otherwise mostly catatonic child. In the musical, his father brings him to see the Acid Queen, then changes his mind and leaves before Tommy partakes of her "charms." The most fundamental difference in the story is the finale, which was rewritten in 1993. Originally, Tommy instructs his followers to become deaf, dumb, and blind themselves to find a heightened state of enlightenment. The crowd rejects this and turns on him. In the stage version, Tommy tells them the opposite: to not try to emulate him, but to rather live out their own normal lives. Upon hearing this message, the crowd still rejects him out of a desire to hear a bolder message from him. Tommy, age 16–25, A young pinball genius. Tenor. Captain Walker age: 25–35, Tommy's guilty father. Tenor. Mrs. Walker, age: 18–30, Tommy's weary mum. Pop Mezzo-soprano. Cousin Kevin, age: 15–20, Tommy's evil babysitting cousin. A young, loutish nuisance. Baritone. Uncle Ernie, age: 30–45, Tommy's perverted uncle. A lecherous bachelor. Tenor. The Acid Queen, age: 20–35, A drug dealer and prostitute. The Specialist, age: 30–50, A very modern doctor who has new theories on how to cure Tommy. Baritone. Sally Simpson, age: 13–20, A typical teenybopper. Soprano. ^ Brian D. Johnson. "Townshend and Tommy in Toronto". The Canadian Encyclopedia. Retrieved 2012-01-12. Back to the Who Tour 51! Rock Is Dead—Long Live Rock! "A Tale of Two Springfields"
"Eyesight to the Blind (The Hawker)"
"We're Not Gonna Take It"
"Let My Love Open the Door"